Originally a Zabrak from the planet Iridonia, Darth Maul abandoned all links with his mysterious past when he became a Sith Lord, apprentice to Darth Sidious. Darth Maul (played by Ray Park) first came to the attention of the Jedi Council of the Old Republic when he attacked Jedi Master Qui-Gon Jinn on the desert planet Tatooine. Qui-Gon was on Tatooine while escorting Queen Amidala of Naboo to Coruscant, and was shocked when Darth Maul swept down on his swoop bike to attack him from above. The Sith was armed and hammered at the Jedi's lightsaber time and again, driving Qui-Gon back in the face of the relentless assault. Qui-Gon narrowly escaped when Queen Amidala's Royal Starship hovered above him long enough to enable him to scramble aboard. Darth Maul was instantly noticeable by his use of a double edged lightsaber which truly set him apart on the Jedi Vs Sith battlefield. 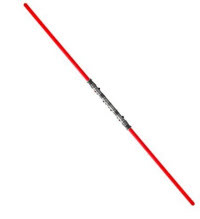 The use of this type of lightsaber and Mauls skill and malice in the Dark arts made him a truly formidable foe. The Jedi Council were deeply disturbed when they heard of Darth Maul's existence. The Sith had been thought extinct for a thousand years, and the re-emergence of a fully fledged and powerful Sith Lord was an extremely worrying development. Darth Maul was acting under the orders of his master, Darth Sidious, to hunt down and kill Queen Amidala of Naboo. After the encounter on Tatooine Maul tracked his prey to her homeworld, and travelled there to intercept her in his sleek Sith Infilitrator starship. Darth Maul came across Qui-Gonn Jinn and his Padawan learner, Obi-Wan Kenobi, in the Theed Royal Palace on Naboo. He engaged both Jedi, using his fearsome double-bladed lightsaber to fight them simultaneously. When the Jedi became separated Darth Maul killed Qui-Gon before the eyes of his apprentice, Obi-Wan. Enraged, the young Jedi pressed home his attack against the powerful Sith Lord. The lightsaber Darth maul used was cut in two by Obi Wan Kenobi and amazingly it still functioned as a single bladed unit. Darth Maul parried all of Obi-Wan's blows and used the dark side of the Force to push the young Jedi into a deep mining pit. Obi-Wan clung desperately to an outcropping in the side of the pit, and summoned the Force to aid him. He telekinetically called Qui-Gonn's discarded lightsaber to his hand and leaped from the pit to slice the startled Darth Maul in two. Want to try out a Darth Maul double-edged lightsaber?